"Ina ng Katipunan" Melchora Aquino, or more popularly known as Tandang Sora is not just your ordinary katipunera but a great cook as well. 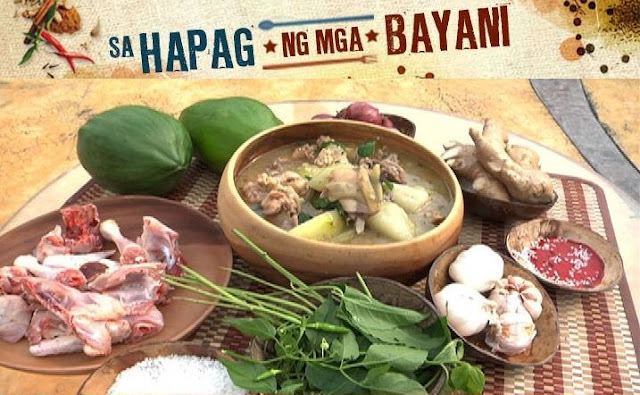 To obviate the fatigue and hardships of the fighting Katipuneros was her cooking of delicious tinola! Great-great-great-grandchild of Tandang Sora shared her recipes Chicken Tinolang Tagalog. 1. Butcher the chicken and drain its blood into a small bowl with a handful of uncooked rice. Set the blood aside until it coagulates. 2. Dress the chicken, making sure that all feathers are plucked, the innards removed and that the chicken cavity is cleaned. 3. Saute the garlic, onion and ginger. Add the chicken, cut up into small pieces. 4. Add about a cup of water. 5. Add the blood and rice mixture. 6. Pour another cup of water into the broth until the soup thickens. When the chicken pieces are tender, add the unripe papaya and let simmer. 7. When papaya pieces have softened, add the sili leaves. Season with salt and pepper to taste. 8. Remove from heat when sili leaves have wilted. 9. To make the dipping sauce, crush some chili peppers into about a spoonful of cooked chicken blood from the tinola broth. 10. Add the juice of one to two calamansi.